Your garbage disposal is easy to forget about. It’s the one appliance in your kitchen you can’t actually see unless you open the cabinet doors under your sink. Just because it’s out of sight doesn’t mean it should be out of mind. Garbage disposals, like any appliance, require routine maintenance in order to keep operating efficiently and enjoy a long life. Now if you think your unit needs professional help we here at Appliance Doctor, an appliance repair company serving Greater Philadelphia, would be happy to come out and take a look at it for you. If everything is running smoothly here are a few steps you can take to keep your disposal happy for a long time to come. Potato peels: These can form a starchy sludge when ground up. Too many of them are a clog risk. Banana peels: These can be just as bad for your disposal as potato peels. They belong in the trash. Coffee grounds or egg shells: These grind into tiny, solid fragments that can easily mix with grease and oils in your pipes to create a dense obstruction. Grease and meat drippings: These are liquid when hot but quickly form greasy, sludgy blocks when poured down the drain. Long, stringy plant material: Think corn husks, corn silk, and similar material. These can wind around your disposals blades and bind them up. Bones: Even small chicken bones can badly jam your unit’s blades. Pits or seeds: These are extremely hard objects that should never go into a garbage disposal. They’re very likely to damage the unit. If you’re having problems with your unit, give us a call. We’re a Greater Philadelphia appliance repair company and we’ll come right out and take a look. Otherwise, maintaining your garbage disposal in good working order isn’t difficult as long as you follow these simple procedures. 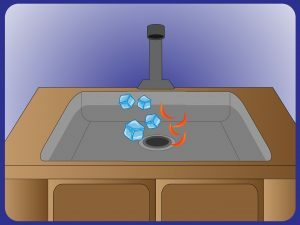 Once a month add an ice tray’s worth of ice cubes into the garbage disposal and grind until it all disappears or forms a slushy mix that temporarily blocks the drain. Then run cold water and wait for any ice slush to melt. Grinding the ice helps keep your blades sharp and cleans clinging debris from around the inside of the unit. After the ice is melted away, with the unit off, add a half cup of baking soda and a cup of vinegar into the chamber. The mixture will fizz and foam for a while. Once it appears the reaction is slowing or finished, rinse it all down the drain with hot tap water. This procedure will help sanitize the grind chamber and remove any nasty, lingering scents. As a final step, if you like, you can grind some lemon, lime or orange rinds to knock out any remaining odors and replace them with a citrusy fresh scent. What if My Garbage Disposal Isn’t Working? Then give us a call. We would be more than happy to come out and take a look. Oftentimes garbage disposal problems aren’t too terribly difficult to fix. As an appliance repair company serving Greater Philadelphia, we can be there quickly to lend a helping hand. Appliance Doctor, Incorporated is a Pennsylvania Corporation offering expert repair services to the Delaware Valley’s residents and businesses. We started in 1964 as a one-man business servicing only washers and dryers. Today, we service more than 110 different brands of refrigeration and appliance equipment across 49 different product types. Our technicians are expected to know so much information! In the 1960s, our service area was limited to Philadelphia. Today, our service area includes all towns in Philadelphia, Bucks County, Montgomery County, Delaware County, and Chester County.